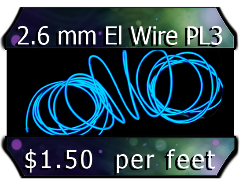 Now you can get low cost EL wire online for $0.99. We ship to the USA, Canada, UK, and around the world. We are pleased to offer Polar Bright 2 EL wire and the new Polar Bright 3 to our customers. 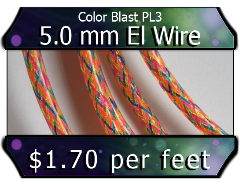 We offer the largest selection of EL wire Polar Bright 2 & 3 wires and drivers. 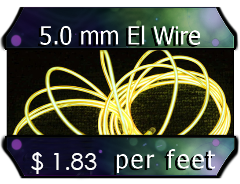 Polar Bright 2 wire is available in 0.9mm, 2.2mm, 3.2mm and 5.0mm diameter. 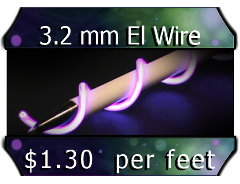 Polar Bright 3 wire is available in 2.6mm and 5.0mm. 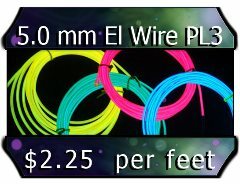 Polar Bright 2 EL wire or Polar Bright 3 is great for events similar to Burning Man, Shambhala music festival, Electric Daisy Carnival, and Wakarusa Festival . 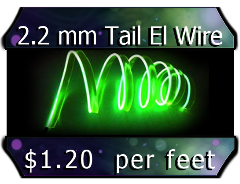 Don't forget to consider EL wire for Halloween and other costumed activities. 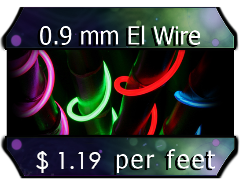 EL wire is an amazing flexible lighting product with endless applications and possibilities. 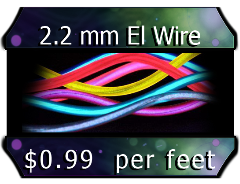 EL wire, also known as electroluminescent wire, is totally flexible, cool to the touch, non-toxic, and produces a true 360 degree radiant soft NEON glow.